Sticky, toffee apples topped with oaty crumble and Carnation Caramel. It's comfort food at its best! 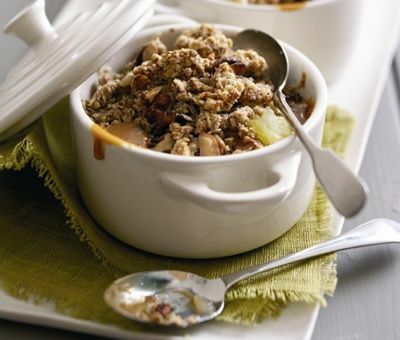 Our rich caramel apple crumble recipe is easy to follow and can be made within half an hour – a great recipe for busy bakers looking for a quick fix of delicious caramel! 1. Preheat the oven to 200°C, (180°C for fan ovens), Gas Mark 6. 2. Peel the apples and chop into a chunky dice. Tip into a pan with 4tbsp water and simmer for about 3 minutes until softened. 3. Place the flour, oats and buttery baking spread into a small bowl and mix together with a fork. Add 1 tablespoon of caramel and mix roughly. Sprinkle through the walnuts. 4. Place 2 teaspoons of the caramel into 4 ramekins and top each with the apple. Dot a little more caramel over each pot. Top each pot with the crumble mixture and bake in the oven for 15 minutes. Once out of the oven, let them cool for 5-10 minutes. Serve your caramel apple crumble with evaporated milk, custard or ice-cream. i have made this at our Scout group camp for the last 3 years and it always goes down well. This is a great crumble and the crumble topping could be used on any crumble. Very easy and reliable. Caramel Apple Crumble Recipe is rated 5.0 out of 5 by 3. Rated 5 out of 5 by Jillyflower from Delicious! I made this for my husband and oh my what a crumble! The topping clumps together a little more than a traditional crumble topping when it’s made, but it’s beautiful. I’m sure it would work with other fruits, but I think caramel and apple are a match made in heaven. I served this with vanilla ice cream made with carnation condensed milk.